Another day and another IPA but this one stands out among the rest. Most IPAs have a single dominant characteristic; hops. Hops are certainly a big part of Sebago’s offering but there is more there. Color is very similar to other IPAs but the aroma has some pine smell to it. Slightly sweet when you drink and the hops finish strong with a fair amount of bite and aftertaste as you would expect from an IPA. When I am reviewing a beer I usually do not have it with a meal but I could certainly see having this with seafood or anything grilled as Sebago recommends in their description. 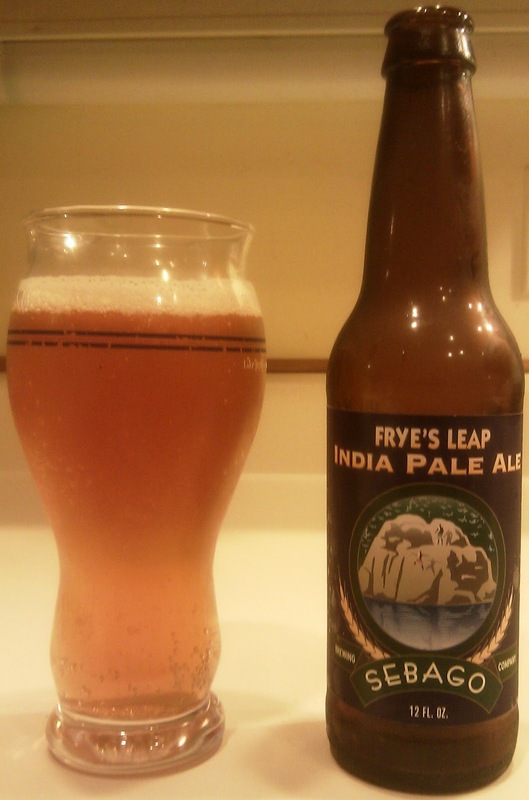 Brewers Description: Frye’s Leap IPA is light copper in color has a medium body with a strong hop flavor and aroma. Frye’s Leap IPA is an intense experience. It is a hoppy medium-bodied ale and is full of character. From the caramel malt which gives our IPA its golden color to the distinct fruity hoppiness, this beer is every bit as exciting as its namesake, the popular cliffs on Sebago Lake. Enjoy this refreshing beer with seafood, spicy foods and all things grilled. Take the Leap!